Uluwatu Temple Tour is one among the Bali half-day tour packages to visit the famous and the beautiful Balinese Hindu sea temple that is located on the cliff on the southern coast of Bali island with the fabulous sunset background. Uluwatu tour is started in the afternoon time and it will spend about 5 - 6 hours to explore the places of interest that are located especially in the southern part of Bali, Indonesia. Uluwatu sunset tour is one of the most chosen Bali short day tours because it does not only see the temple but it also we will experience the popular Kecak dance performance with the breathtaking sunset backdrop. Uluwatu temple tour is a private Bali tours and it will be accompanied by our professional and friendly driver and provided with the air-conditioned vehicle for your comfort. 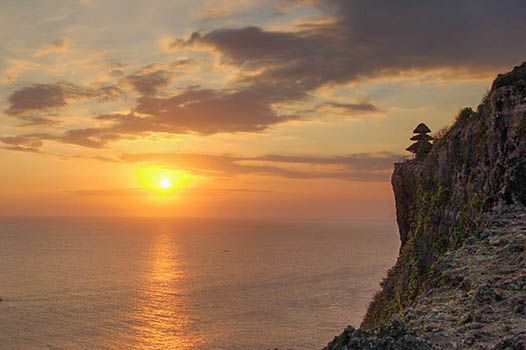 Below is the itinerary of Bali temple Uluwatu sunset tour package in a half-day around 5 hours to 6 hours, the Uluwatu tour package from Bali Places Tour is a private day tour with a private vehicle (NOT a sharing tour) and you will be accompanied by a qualified driver. The first place to visit in Uluwatu tour package is The Garuda Wisnu Kencana (GWK) Cultural Park that is situated in Ungasan, Jimbaran, Badung Regency, Bali. The primary feature of GWK Cultural Park is the huge statue of Garuda Wisnu that is built to be certainly one of the tallest and biggest present day sculptures. Along with its pedestal, the Garuda Wisnu Kencana statue is designed to reach 120 meters high with wings span 64 m across, and it is still under construction. The Garuda Wisnu Kencana Statue demonstrates the God Wisnu sitting down on the legendary bird of Garuda. Additionally, the term Kencana represents gold layering several major elements of the statue, which includes the crowns worn by the bird of Garuda and also Lord Vishnu. The statue is designed by I Nyoman Nuarta, he is one of Indonesia’s most reliable sculptors. The next destination to go is to visit the Pura Luhur Uluwatu Temple, it is a Balinese sea temple located on the cliff on the southern coast of the island and facing toward to the Indian ocean. The Uluwatu temple built in the 11 century by Mpu Kuturan, it is regarded as one of the Sad Kahyangan temples and is dedicated to the God in his manifestation as Lord Rudra which is controlling the southwest direction. 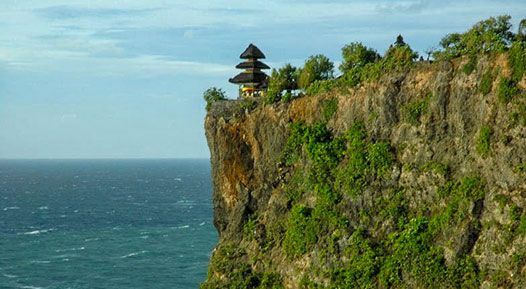 The Uluwatu temple is situated in the village of Pecatu, Kuta Sub-district, Badung Regency, Bali. It takes about 31 Kilometers from Denpasar City. Uluwatu temple inhabited by hundreds of monkeys that live wild in the forest around the temple and the best time to visit the temple is in the afternoon before sunset. The entrance fee to visit the Uluwatu temple is IDR 30,000 /person (valid for 2017, the entrance ticket may change without any prior notice). The interesting thing that can be encountered when visiting the temple of Uluwatu is the Kecak dance & fire dance performance. Kecak is a type of Balinese dance and sound drama which was introduced in the 1930s on the island of Bali, Indonesia. Since its development, it is often performed mainly by adult men. The Kecak dance show in Uluwatu temple is performed on the open stage, and the dance performance is started before the sundown. The Kecak dance performance is optional in our half-day Uluwatu temple tour package, it means you could spend your time to watch the dance show or you could skip it. The entrance ticket to watch the Kecak dance performance is IDR 100,000 /adult and IDR 50,000 /child (2 - 9 yrs old). 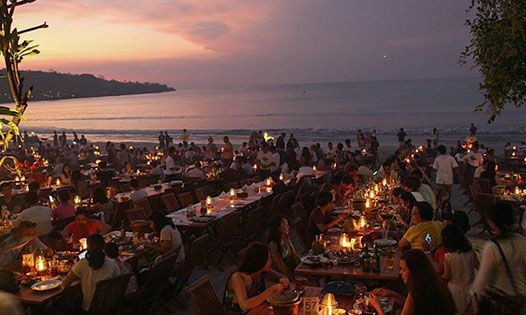 The last destination to go in Uluwatu tour itinerary is the Jimbaran Bay for having seafood dinner. Jimbaran Bay Seafood is a certain number of the dining place (over 30 restaurants) which is located along Jimbaran Bay Coastline. It is usually recognized as Kedonganan beach. Jimbaran Bay is the best place in Jimbaran Kuta for having seafood dinner that offers a fresh seafood. The dining place is right on the sand with its private beach. The Jimbaran Bay seafood dinner is optional in our half-day Uluwatu sunset tour itinerary, it means that you could take your time to have dinner in Jimbaran Bay or you could skip it and we go back to the hotel. Below are the frequently asked questions regarding the Uluwatu temple tour, the Kecak dance performance and also the sunset. If you have any questions, feel free to contact us. If it is raining, will the Kecak dance still be performed? The Kecak Dance is performed on the open stage, but when it's raining the show will be performed on the indoor stage located in the building on the right side of the temple. Click here to see the updated weather in Uluwatu Temple, Bali. What time is the Kecak Dance performance in Uluwatu temple started? The Kecak dance starts at 6.00 PM or in a few minutes before sunset time. Should I wear a sarong to visit the Uluwatu Temple? Yes, everybody must wear a sarong to visit Uluwatu Temple, especially for visitors that are using short pants or skirts (for ladies). The sarong and the scarf are free to use, they are included when you pay the entrance fee. Don't forget to put them back when you leave the temple's area. What time is the sunset in Uluwatu temple? Mostly we can enjoy the sun goes down in Uluwatu Temple at 6.00 PM or in couple minutes after 6.00 PM. Click the links below for the accurate time of the sunset in Uluwatu Temple, Bali. I heard the monkeys in surrounding Uluwatu Temple are cheeky, stealing the tourist's belongings, is it true? The monkeys in Uluwatu temple are in the wild, they will always looking for the food around the temple's area. All visitors are advised to keep their belongings secured such as; sunglasses, glasses, hat, mobile phones, camera, handbag, etc, so as not to be stolen by monkeys. It is also recommended to not bring snacks. How much the entrance fee to visit Uluwatu Temple? 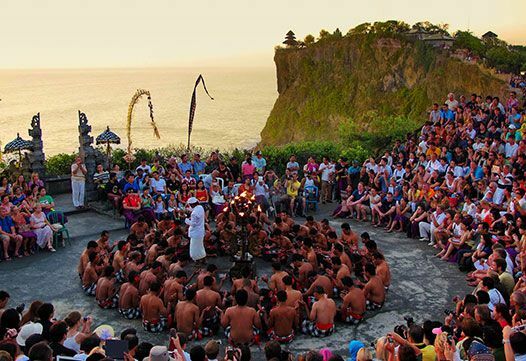 How much is the entrance ticket to watch the Kecak dance performance in Uluwatu temple? The entrance ticket to see the Kecak dance show is IDR 100,000 /person and IDR 50,000 for children. How much the entrance fee to visit Garuda Wisnu Kencana Cultural Park? The entrance fee to visit Garuda Wisnu Kencana (GWK) cultural park is IDR 125,000 /person. Could I change the itinerary or skip some places that I don't want to visit? Yes, the itinerary is flexible, you could skip or change/replace some places as long as it on the same direction to Uluwatu temple (just to avoid losing time on the way).